Single-pane-of-glass view on the effectiveness of your existing security systems through log correlation: firewall, sandbox, IPS and endpoint security. Use performance-based quantitative analysis to determine if you are achieving ROI from your existing security investments. 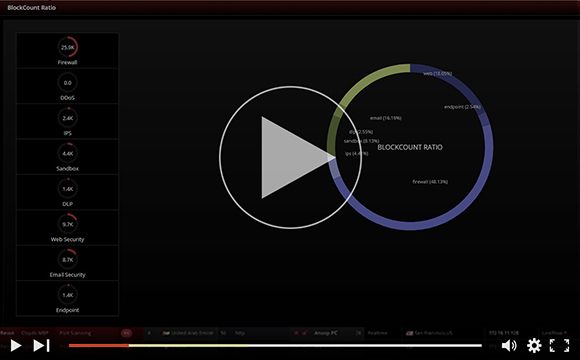 Obtain a summary of the ratio of attacks blocked at each layer of your defense-in-depth security infrastructure, and what percentage went through. While organizations have long needed to safeguard their IT assets and their sensitive data, new threats and new regulations arise every day. Therefore, organizations need to validate that their existing security investments are always operating to their full potential. LinkShadow enables you to evaluate the performance of your security devices' detection and prevention capabilities with our patented Link Luminescence Engine (LLE) that analyzes and correlates information related to blocked threats, and validates the effectiveness of your multi-layered defense-in-depth infrastructure.